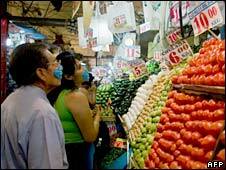 Prices of food and water have rocketed in Mexico, fuelled by a "black market" around the swine flu virus outbreak. Masks that before the panic cost one peso (£0.05) are now being sold for up to 50 pesos (£2.40) in some districts of Mexico City. Carlos Martinez, who works for an insurance company in the central city of Guadalajara, told the BBC they were worth 25 pesos there. Residents in other parts of the country also say that prices of water and basic foods such as rice and canned tuna have risen, as people follow the government's recommendation to stay in. In Chimalhuacan, a low-income town east of Mexico City, the price of bottled water has more than doubled. "A can of tuna which was worth 13 pesos is now being sold for 20. They [the shops] also hide the soap or won't sell it to you unless you buy more stuff," said Fernanda Aguilar, a resident in the Alfareros district. "They are abusive." The government says it has increased inspections of pharmacies after reported hikes in the price of the antiviral medicines recommended against the swine flu. The Federal Consumer Agency, Profeco, said two pharmacies had been sanctioned for selling them at abusive prices. With the inspections, the price of the antiviral Tamiflu has remained stable. But it tends to run scarce in many pharmacies, as it does not require a medical prescription to be sold. 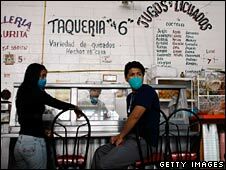 Many Mexicans are building up stocks of the medicine in case a member of their family is affected by the virus. Security officials say that 13 people have been arrested, accused of selling masks at abusive prices. One of them was a woman who had bought several boxes of masks and was selling them for a price 10 times higher. The consumer agency has confiscated 5,000 masks that were distributed freely by the government and were being sold in shopping malls. It is not only shops that are trying to reap benefits from the flu outbreak. Politicians campaigning for parliamentary elections in July are now distributing masks among potential voters in several parts of the country. The Green Party has set up a phone line for people to get recommendations on how to protect themselves from the virus. The advertising spot which runs in Mexico City reads: "The Green Party worries about your health." A criminal gang also took advantage of the situation this week, when three men robbed a shopping mall in Mexico City wearing masks that gave them the perfect cover. When it comes to making profit out of panic, it seems creativity sometimes has no limits.